^ a b c Endo A (1992). “The discovery and development of HMG-CoA reductase inhibitors” (PDF). J Lipid Res 33 (11): 1569–1582. PMID 1464741. http://www.jlr.org/cgi/reprint/33/11/1569. ^ Endo A, Kuroda M, Tsujita Y (1976). “ML-236A, ML-236B, and ML-236C, new inhibitors of cholesterogenesis produced by Penicillium citrinum”. J Antibiot 29 (12): 1346-1348. PMID 1010803. ^ Tsujita Y, Kuroda M, Tanzawa K, Kitano N, Endo A (1979). “Hypolipidemic effects in dogs of ML-236B, a competitive inhibitor of 3-hydroxy-3-methylglutaryl coenzyme A reductase”. Atherosclerosis 32 (3): 307-313. PMID 223590. ^ Kuroda M, Tsujita Y, Tanzawa K, Endo A (1979). “Hypolipidemic effects in monkeys of ML-236B, a competitive inhibitor of 3-hydroxy-3-methylglutaryl coenzyme A reductase”. Lipids 14 (6): 585-589. PMID 110993. ^ The Lovastatin Study Group II (1986). “Therapeutic response to lovastatin (mevinolin) in nonfamilial hypercholesterolemia. A multicenter study”. JAMA 256 (20): 2829-2834. PMID 3534333. ^ Grundy SM (1988). “HMG-CoA reductase inhibitors for treatment of hypercholesterolemia”. NEJM 319 (1): 24-33. PMID 3288867. ^ Christians U, Jacobsen W, Floren LC (1998). 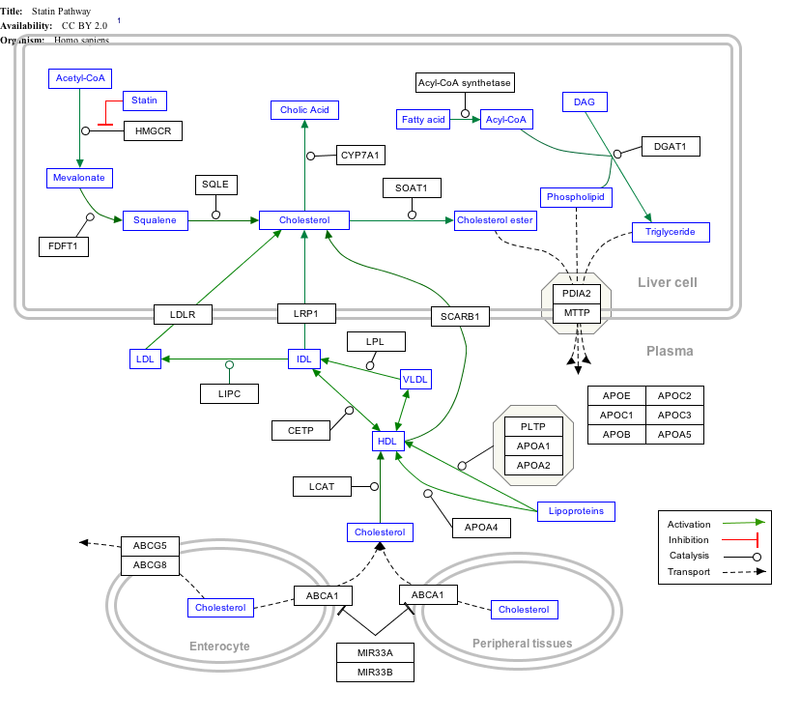 “Metabolism and drug interactions of 3-hydroxy-3-methylglutaryl coenzyme A reductase inhibitors in transplant patients: are the statins mechanistically similar?”. Pharmacol Ther 80 (1): 1-34. PMID 9804052. ^ Ma PT, Gil G, Südhof TC, Bilheimer DW, Goldstein JL, Brown MS (1986). “Mevinolin, an inhibitor of cholesterol synthesis, induces mRNA for low density lipoprotein receptor in livers of hamsters and rabbits”. Proc Natl Acad Sci USA 83 (21): 8370–8374. PMID 3464957. ^ “Dietary cholesterol and egg yolks: not for patients at risk of vascular disease”. Can J Cardiol 26 (9): e336–9. (2010). PMC: 2989358. PMID 21076725. https://www.ncbi.nlm.nih.gov/pmc/articles/PMC2989358/. ^ Furberg CD, Pitt B (2001). “Withdrawal of cerivastatin from the world market”. Curr Control Trials Cardiovasc Med 2 (5): 205-207. PMID 11806796. ^ Functional Characterization of the Vitamin K2 Biosynthetic Enzyme UBIAD1. 10. (2015). doi:10.1371/journal.pone.0125737. PMC: PMC4398444. PMID 25874989. https://www.ncbi.nlm.nih.gov/pmc/articles/PMCPMC4398444/.